Over the course of the Dogfooding Best Practices series, we’ve discussed the advantages dogfooding brings and why some programs still experience friction. The last installment focuses on overcoming organizational resistance by reinventing your program through a “Customer Zero” approach. With a company culture that promotes and values employee feedback, you’ll see the highest return from dogfooding and long-term benefits for your organization and future products. In last week’s blog post, we looked at common issues that can derail dogfooding programs. Issues like inconsistent participation, low-quality feedback, and little to no organizational support can all point to larger issues at play. Bandwidth. It can be difficult for employees to set aside time to participate in your test. Since they’re already working on products or business-related tasks, providing feedback can seem like additional work that interferes with their responsibilities. Even the idea of limited bandwidth can negatively impact employees’ ability to allocate time. Entitlement. Employees sometimes see receiving products or test units as a work perk rather than an incentive to provide quality insights. Because of this, they may not feel the need to earn an incentive or reciprocate through participation. This attitude makes reliable test participation difficult to maintain. Culture. Company culture is the most influential contributor to dogfooding success. Without an organizational commitment to interdepartmental communication, listening to employees, or encouraging product knowledge, it’s difficult to get a dogfooding program off the ground. Some of the biggest roadblocks for dogfooding programs are information silos. Without pathways for collaboration, departments can develop unreceptive attitudes toward other departments’ work and product feedback. When company leadership fails to stress the importance of contributing feedback, it exacerbates employee entitlement and bandwidth challenges. Using customer feedback to improve the product experience is a not-so-secret formula for success. Three out of four companies that deliver best-in-class customer experiences rely on customer feedback to do so. Leveraging your employees as the first point of contact between your product and your target audience injects a focus on customer feedback earlier into development. This is what dogfooding with a “customer zero” mindset means. It turns dogfooding into a company initiative. The simple act of redefining “employee feedback” as “customer zero feedback” conceptually aligns dogfooding with the customer-focused initiatives found in most companies. This gives your stakeholders something more concrete to connect with. It highlights the value of your employees’ efforts. Being “customer zero” elevates the perception of your employee testers’ contributions to your dogfooding efforts. Instead of a chore, providing feedback becomes an expression of commitment to product excellence. It’s the first step toward a cultural sea change. As I mentioned earlier, culture is hugely influential to the adoption of dogfooding. The more traction “customer zero” gains in your company, the easier stakeholder and employee support will come to your dogfooding program. Part and parcel of pushing a “customer zero” mindset is building a brand around the idea. To do this, take a few tips from your Marketing team. Incorporate “customer zero” into your messaging. Visually brand your emails, forums, and tester community. If you have the resources, program-branded swag like t-shirts, hats, or mugs can make effective participation incentives. This has the additional benefit of promoting awareness for your program throughout your organization. 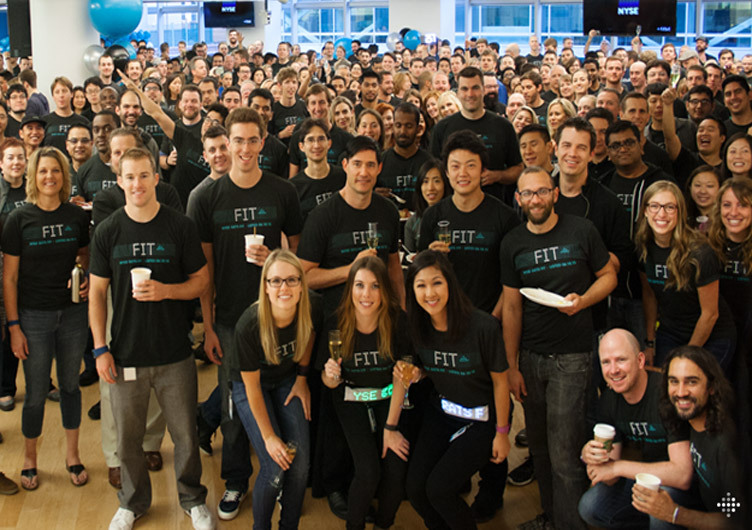 For the better part of the decade, Fitbit has been home to a vibrant employee beta testing community. Their tactics include product incentives, organized workout days, branded apparel, and testing culture. Winning over organizational leadership makes it easier to promote customer zero initiatives. A manager, director, VP, or executive who believes in your mission can use their influence to extend awareness for your program. If no one in your organization immediately springs to mind, start closer. Find departments that naturally align with your efforts. QA, engineering, and support can all benefit directly from the insights revealed by employee product feedback. Once you’ve identified a few candidates, ask them to shoot out a quick email, reach out to other leaders, or even wear your swag. Done often enough, these simple endorsements can have a big overall impact on organizational awareness. It’s one thing to talk a big game, but true value comes from results. Showcasing the ROI of your efforts gives team leaders the hard proof they need to take your customer zero program seriously. Cultivate dogfooding processes that enable you to keep track of your metrics. This can range from switching to Google Forms instead of email to leveraging end-to-end software like the Centercode Platform with built-in feedback collection, reporting, and community-building features. Whatever method you choose, make sure your data is neat, up-to-date, and accessible to your organization’s key decision makers. You can find a simple calculation for showing the ROI of your dogfooding efforts in our on-demand webinar, 3 Secrets That Increase the Value of Dogfooding Programs. If you’ve stuck with us through all four parts of the series, you have the working knowledge to get started right now. Want to delve deeper into strategies for maximizing the value of your program? Schedule a meeting with our experts to see how you can increase the return from employee product testing. Special thanks to Centercode CEO Luke Freiler and his clever girl, Gemma.